Set includes - a completely programmed board that works in industrial temperature range, 32 green LED pieces to provide cue status, 1 green LED for the READY indicator, 1 red LED for the MAIN indicator and 1 yellow LED for the FireLine connection indicator. We also include in this set a two foot long flat cable to connect your LEDs and miscellaneous board connections. Communication - the circuit board has a standard MerlinFire communications port. You can connect the unit through two common wires to another MerlinMatchSE or other product including this port. Fireline works great for very long distances (we tested 4 kilometers - about 2.5 miles). You can even connect more MerlinMatchSEs to the PC. Using the MerlinFire software, you've got full control over the whole firing network. How many modules can be in a firing network? 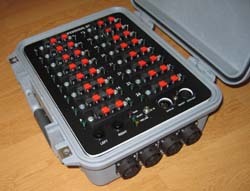 - MerlinFire basic communication supports up to 100 firing modules! The protocol can be expanded up to 32,768 modules, even though it is not likely this extreme amount is needed. 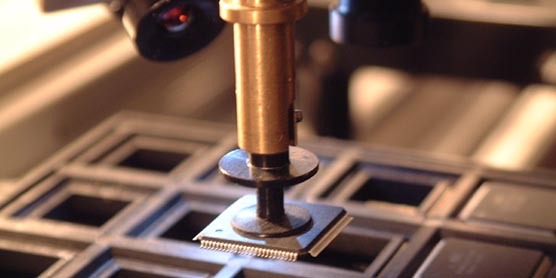 These modules can be a mixture of all product types we produce. 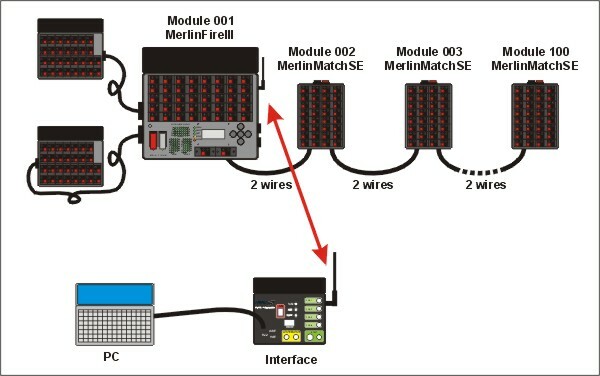 If you connect this module to the nearest wireless module (MerlinFireII or MerlinFireIII), this module will bridge the wireless signal and you can then work with the MerlinMatchSE wireless, as well. 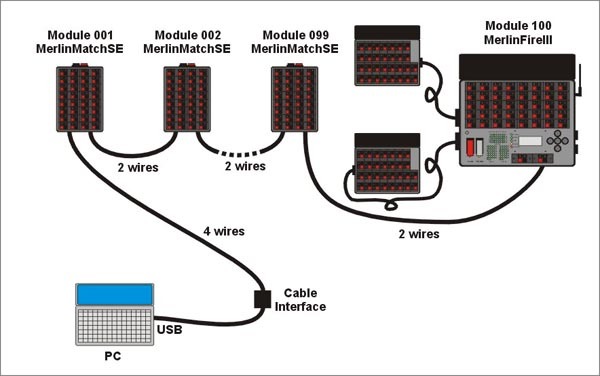 MerlinMatch Special Edition was developed for the handyman who wants to build their own professional sequencer with the MerlinFire communications port. 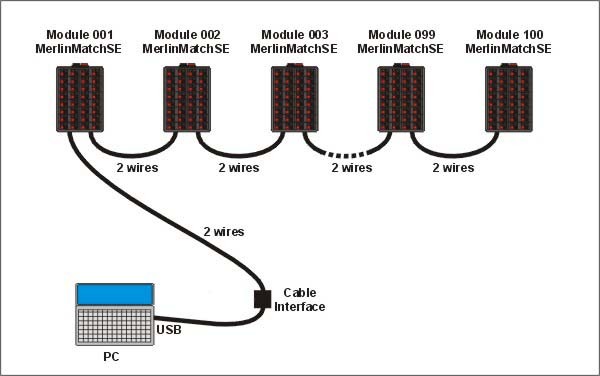 It can be used with MerlinFireII, MerlinFireIII, MerlinMatchII (in one network) or each MerlinMatch module can be programmed individually in stand-alone mode. Each module has 32 cues and we have designed it to work with a 12V DC power supply or 24V DC power supply. Both versions have 24V DC firing impulses. This extra voltage is very important if you have many cues requiring closely timed firing. 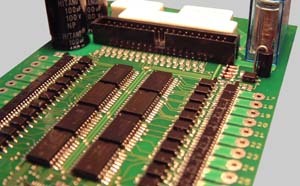 FireLine triggering input (8-160V DC input impulse, 80 mA minimum current) - possible connection to all firing systems like e-match. This FireLine has 22 Ohms resistance for possible FireLine continuity test. The cable Interface can be powered from a PC's USB port where a standard 5V DC is present. But if you decide to use a COM port/serial port instead of the USB, you'll need to use an external 5V DC power supply. This is in case you use 2 wires to the nearest MMSE instead of four wires.